This is a step-by-step guide to writing a Bot in C# using the Bot Framework Connector SDK .NET template. 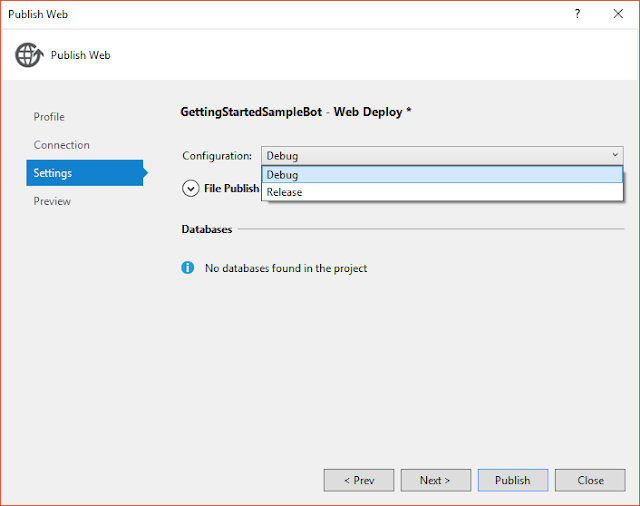 Create a new C# project using the new Bot Application template. The core functionality of the Bot Template is all in the Post function within Controllers\MessagesController.cs. In this case the code takes the message text for the user, then creates a reply message using the CreateReplyMessage function. The BotAuthentication decoration on the method is used to validate your Bot Connector credentials over HTTPS. 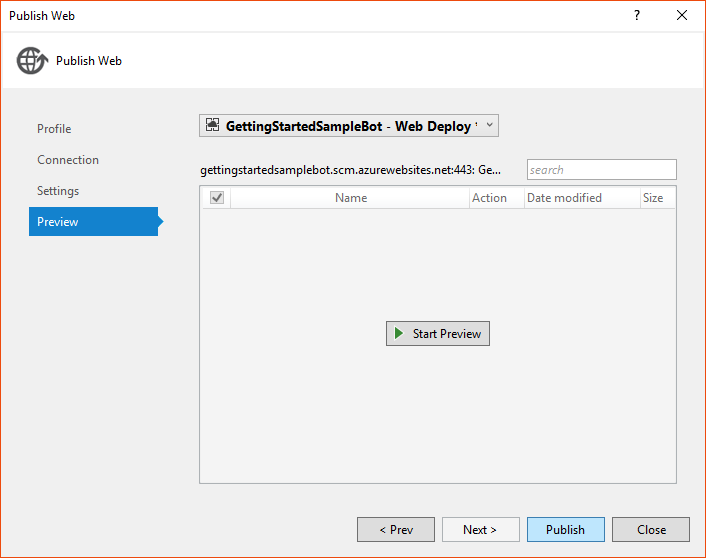 Use the Bot Framework Emulator to test your Bot application The Bot Framework provides a a channel emulator that lets you test calls to your Bot as if it were being called by the Bot Framework cloud service. To install the Bot Framework Emulator, download it from here. Once installed, you're ready to test. 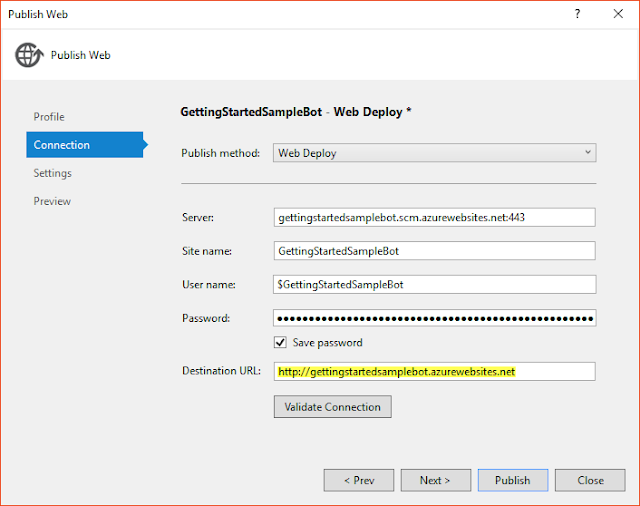 First, start your Bot in Visual Studio using a browser as the application host. Now open the Bot Framework Emulator. There are a few items that you will need to configure in the tool before you can interact with your Bot Application. When working with the emulator with a bot running locally, you need: The Url for your bot set the localhost:<port> pulled from the last step. > Note: will need to add the path "/api/messages" to your URL when using the Bot Application template. 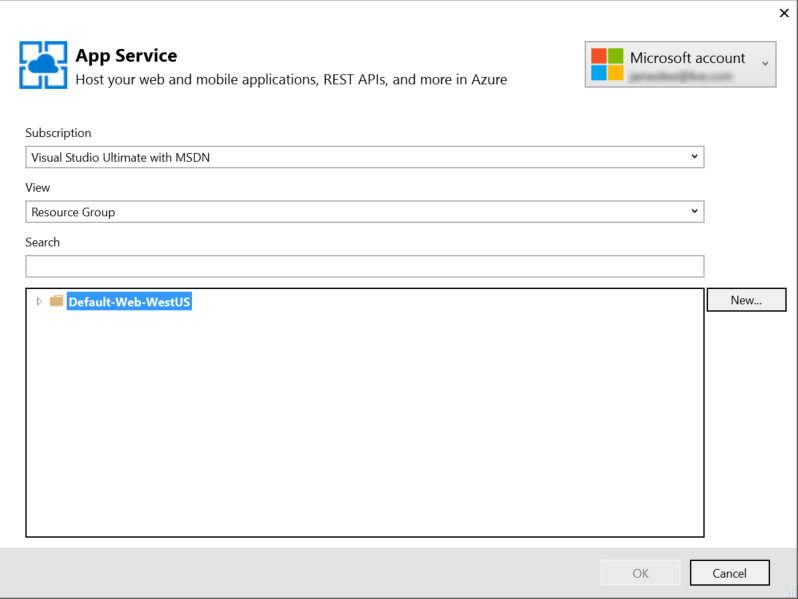 Empty out the MicrosoftAppId field Empty out the MicrosoftAppPassword field This will only work with the emulator running locally; in the cloud you would instead have to specify the appropriate URL and authentication values. For more about the emulator, read here. Now that everything is configured you can interact with your service. The bottom of the Bot Framework Emulator application has a Text Box that you can use to enter a message, this message will be echoed back to you. - For the complete source you can download it here. 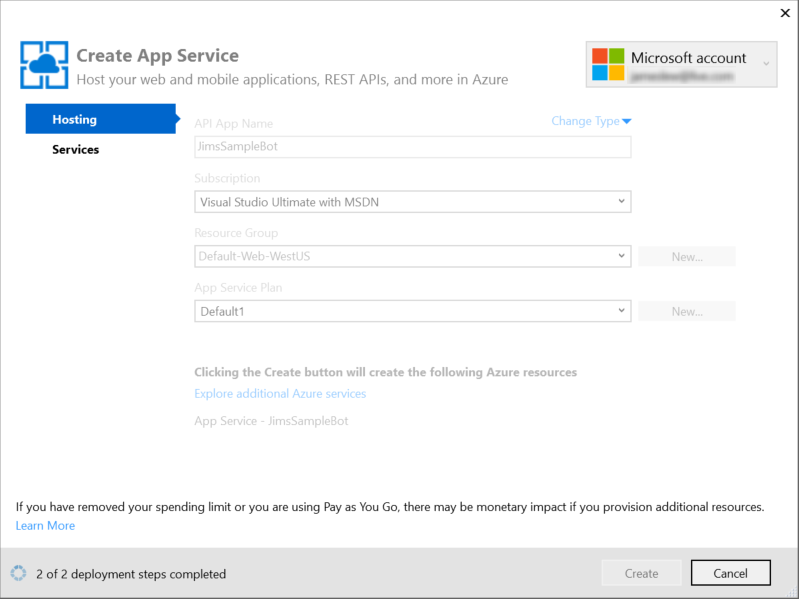 The next step in the Azure App Service publishing process is to create your App Service. Click on "New…" on the right side of the dialog to create the App Service. The Create App Service dialog will be displayed, fill in the details as appropriate.Make sure to choose "Web App" from the Change Type drop down in the top right instead of "API App"(which is the default). One final complexity on this dialog is the App Service Plan. 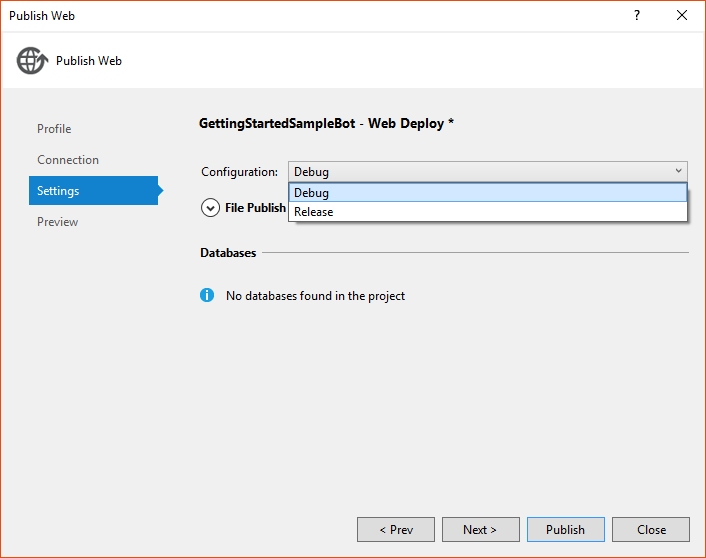 This just lets you give a name to a combination of location and system size so you can re - use it on future deployments. Just put in any name, then choose the datacenter and size of deployment you want. Once you hit okay on the App Service Plan, you'll have defined your App Service completely. Hit Create, and you'll be taken back to the Publish Web Wizard. Now that you've returned to the Publish Web wizard copy the destination URL to the clipboard, you'll need it in a few moments. Hit "Validate Connection" to ensure the configuration is good, and if all goes well, click "Next". By default your Bot will be published in a Release configuration. If you want to debug your Bot, change Configuration to Debug. Regardless, from here you'll hit "Publish" and your Bot will be published to Azure. You will see a number of messages displayed in the Visual Studio 2015 "Output" window. Once publishing is complete you will also see the web page for your Bot Application displayed in your browser (the browser will launch, and render your Bot Application HTML page), see below. Registering your Bot tells the Connector how to call your Bot's web service. Note that the MicrosoftAppId and MicrosoftAppPassword** are generated when your Bot is registered with the Microsoft Bot Framework Connector, the MicrosoftAppId and MicrosoftAppPassword are used to authenticate the conversation, and allows the developer to configure their Bot with the Channels they'd like to be visible on. The BotId, which you specify, is used for the URL in the directory and developer portal. Go to the Microsoft Bot Framework portal at https://dev.botframework.com and sign in with your Microsoft Account. Click the "Register a Bot" button and fill out the form. Many of the fields on this form can be changed later. Use a the endpoint generated from your Azure deployment, and don't forget that when using the Bot Application tempalate you'll need to extend the URL you pasted in with the path to the endpoint at / API / Messages. 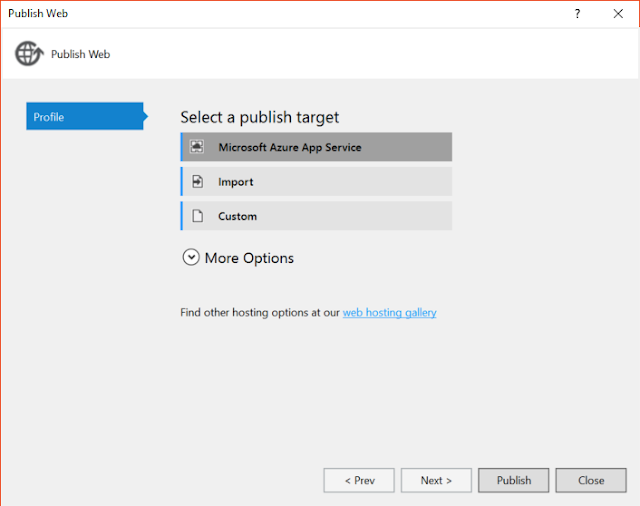 You should also prefix your URL with HTTPS instead of HTTP; Azure will take care of providing HTTPS support on your bot. Save your changes by hitting "Create" at the bottom of the form. Back in the developer dashboard for your Bot there's a test chat window that you can use to interact with your Bot without further configuration, and verify that the Bot Framework can communicate with your Bot's web service. Note that the first request after your Bot starts up can take 10 - 15 s as Azure starts up the web service for the first time. Subsequent requests will be quick. This simple viewer will let you see the JSON object returned by your Bot. Now that you have a Bot up and running, you'll want to configure it for one or more channels your users are using. Configuring channels is a combination of Microsoft Bot Framework workflow and conversation service workflow, and is unique for each channel you wish to configure. To configure a channel, go back to the Bot Framework portal at https://www.botframework.com. Sign in, select your Bot, and go to the channels panel. << Previous Xamarin Forms and AI Bot Fram..
Be the first to Comment. You can ask a Query or Share your toughts or Just say thanks.